Here’s a way to prepare collard greens that cuts the cooking time down to a fraction of the long simmer typically associated with these tough leaves. In this case, the leaves are cut into very thin strips, which breaks the fibers and helps the greens wilt. The seasonings are lighter, too, with pork fatback, salt pork, or ham hocks being replaced with olive oil, chile flakes, and garlic. Strip the stems from the collards and discard them. Rinse the leaves and drain, but do not dry them. Stack several of the leaves and roll them into a tight cylinder. Using a very sharp knife, slice the cylinder crosswise into thin strips, about ⅛ inch wide. Repeat until you have sliced all the greens. You will have about 5 cups total. Slice the garlic cloves. Pound the garlic in a mortar and pestle with the salt until it is a paste. Set a saucepan over medium heat. Add the olive oil, chile flakes, and garlic, and sauté, stirring, about 15 seconds. Add the collard greens and turn over with the garlic and chile flakes to mix. Continue to cook for 10 to 15 minutes. If greens become too dry, add the water or broth. The collards are finished when wilted and somewhat soft. 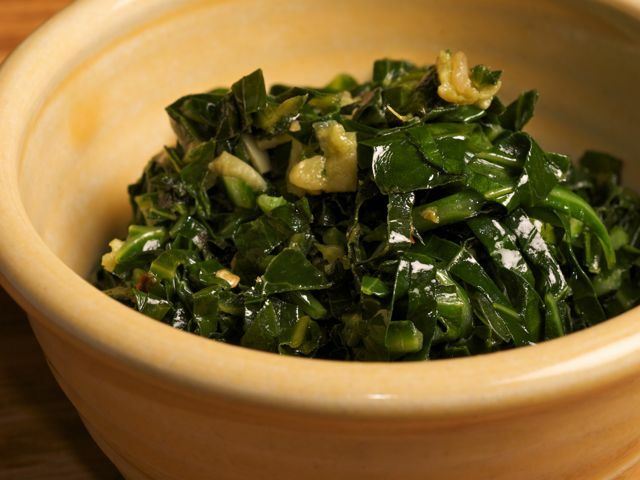 If you prefer your collard greens more tender, cover with a lid and cook 5 minutes longer. Season with additional salt if needed.